In our recent webinar on local ranking factors, our expert panel agreed that it’s going to be important to make use of Google My Business’ native features in the coming year. Today, Steady Demand’s Ben Fisher explains how to use Google Posts to boost SEO and win customers. One of the most powerful local SEO strategies a business can use to improve their local search rankings is claiming and optimizing their Google My Business (GMB) listing. Even though claiming your Google My Business listing doesn’t guarantee ranking in Google search results, Moz and other reliable SEO sources have shown GMB listings to be a known local search ranking factor. Not only can your Google My Business listing help with local search rankings, but it’s also one of the most important ways to connect online with potential customers or clients. Google is taking their Google My Business program seriously. Over the years the GMB program has been in place, Google has added great features that help make local business listings more robust. These features allow business owners to include additional information so potential customers who search for your business can learn more about what you have to offer. A Google My Business Post can include an image, copy, a Call To Action (CTA) and a URL that you can use to link to a landing page or your website. Each Post has a limit of 300 words, but only the first 100 characters (or fewer) of the Post appear in the business’ Knowledge Panel. Following SEO best practices, make sure to put keywords and the most important message towards the front of the paragraph of your Post. The best image size for your Google Post is 750 x 750 and the image should be centered so that it will still look good if it gets cropped. Don’t upload an image that’s smaller than 250 x 250 — it won’t be accepted. Be sure to preview the post before publishing. If you are not happy with the way your image looks, try uploading a 400 x 300 image. If your image has text on it, keep in mind that the text may get cut off on mobile devices. When possible it’s best to just stick with an image with no text on it. Remember, a Post is your opportunity to talk directly to your customers, so speak semantically and use a “real-world” conversational tone in your copy. Make sure the landing page you send visitors to matches the content of the Post and meets a visitor’s expectations. Want the visitor to book an appointment with you? Select “Book” and link to your scheduling page on your site or include your phone number so it’s easy for them to call you to schedule the appointment. Want to increase your email subscriber list? Choose the “Sign up” option. Are you offering a coupon or having a sale? Pick “Get offer” and include a special offer or coupon – something that will help get that potential customer to stop in or buy from you. Take advantage of this space to create Posts that grab a visitor’s attention. The GMB Post allows you to speak directly to the person who sees this page online – so make your message worthwhile to them. Don’t waste valuable characters with hashtags or keyword stuffing – it doesn’t give you any SEO benefit and looks spammy to the user. Use this valuable spot to feature something that is of value to your potential customers. A restaurant in Irving, TX, did just that…and got some amazing results! GMBData.com was working with one of their clients, Aspen Creek Grill, a restaurant in Irving, TX. They used Google My Business Posts to feature their Veteran’s Day Weekend lunch special for the weekend of November 10th. The Post was setup as an “event” and was published live on GMB a week before the holiday to build interest and capitalize on local search trends. 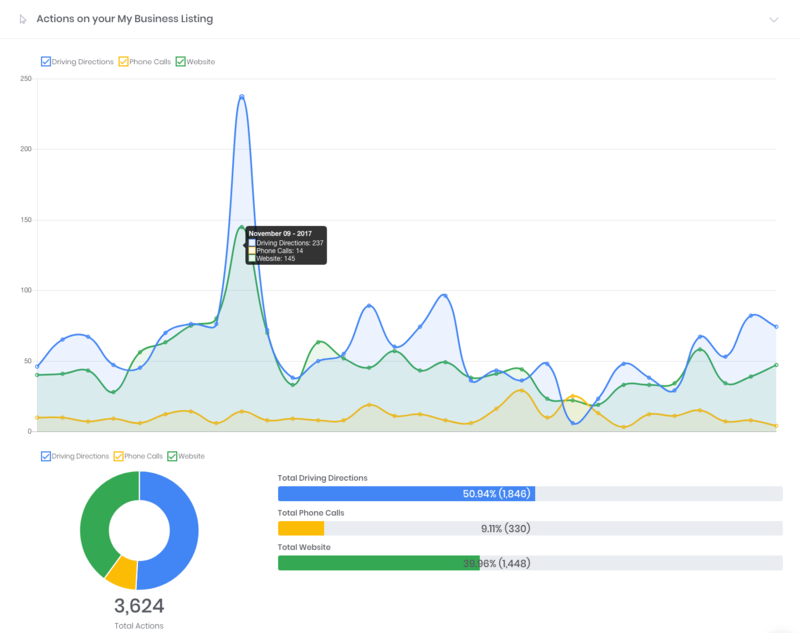 The GMB insights data that they captured showed that on November 9, 2017, (the day before the event “started”), this business’ Google My Business listing in Irving, TX, generated all-time highs in Discovery Searches, Direct Searches, Views on Search (associated with local 3-pack rankings), Views on Maps and even Direction Requests over the last 18 months. After diving into Google trends and researching keywords like “Veterans Day Lunch” and “Free Veterans Day Lunches,” GMBData.com found that there were large increases in the number of searches for exactly the type of event that the restaurant was promoting during the week of November 5th-11th. Since the location of this business (Irving, TX) is close to a lot of active and non-active duty military communities, it is likely that the utilization and timing of the Google My Business Post correlated to the increase in Search Visibility and Actions recorded on GMB. In this case, search volumes for keywords like “Veterans Day Lunches” likely increased (as Google Trends indicated) the week after publishing the Post, and Google used the date and timing of the Event Post (along with the keywords in the content of the Post) to determine relevancy and that helped the restaurant’s business listing rise to the top of search results during that timeframe. The real key to the success in this example was not just about throwing up any old Post, it was about publishing content that connected with users in those coveted “micro-moments.” It was carefully orchestrated and was a true confluence of opportunity and planning. This is just one example of how Google Posts can have a big impact on search presence for local businesses! You make a social media calendar, a blog calendar, a print advertising calendar…Google My Business Posts are important enough to have time devoted to schedule out what type of Posts your company will create and when. Many feel that Google My Business Posts are essentially a marketing function vs. a digital marketing strategy, so it’s important to get your traditional marketing team involved in scheduling out what types of posts you will create…and when. Get your design team involved. If you have a professional staff of in-house designers, having them create a post image will not only be an “Easy…I can knock it out in 10 minutes” project, but it will also get the more “traditional” designers on your team to feel more like a part of the digital marketing side of the business. Are you a solopreneur with no design team? No worries! 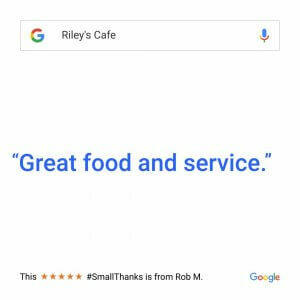 Google’s Small Thanks with Google program helps small- to medium-sized businesses use their Google My Business online reviews to create design materials you can then download and use in social media, printed materials, etc. With the Small Thanks program, you get a variety of pre-designed materials you can use to promote your business – and the images are perfect to use in your Google My Business Posts! Posts stay live for seven days (and events stay up until the day after the event end date.) But don’t think all your creative hard work was a waste! Your older Posts are archived and show up in a “carousel-like” view when a person clicks on your current Post — so searchers can go back and see other Posts you’ve created. Give a quick summary of your latest blog post and link to it. Mention upcoming tradeshow or events you will be featured or have a booth at. New video on YouTube? Link to it. Feature one of your favorite employees – and explain why they’re your favorite. Highlight a new product or feature of a product or service you offer. Having a sale or special offer? Make that offer available to your future customers! Something going on in your local community? Get engaged and help promote what’s going on in your local area. Do you have any business news you’d like to share? GMB Posts are the place to do it! Have a job opening? Posts make a great “Help Wanted” signs. Does your biz support a local or national charity? Show your support and try and get contributions for the charity through GMB Posts. Post location-specific information, like changes to your business hours, emergency closures due to weather, etc. Show off your 5-star reviews with Small Thanks with Google. Running a contest or give-away? This is a fun place to promote it. What will come next? We’re not 100% certain what more Google has in mind for Google My Business, but with the rapid speed they’ve been releasing great features that help businesses engage with customers like never before, we hope they keep going.